I’ve been toying with the idea of settings poems to music for a year or so, but something has finally prompted me to do it. 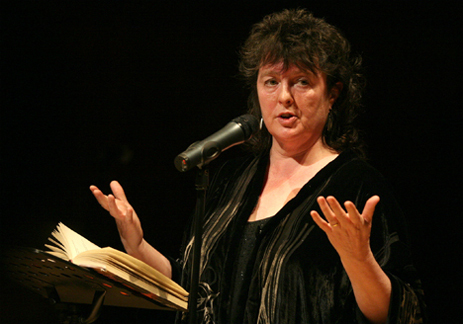 Terrifyingly for me, I’ve somehow decided to start with our poet Laureate Carol Ann Duffy’s best-known poem – Prayer. Talk about jumping in at the deep end! When I’ve heard poems set to music in the past, I’ve generally had trouble when I hear a melody seemingly stomping over what each line wants, in order to fit each stanza into a similar tune. Having a go at poem setting myself, I finally understood why this was done – in some cases, it’s a compromise to fit the poem into a song form. So, I decided that song form wasn’t important to me. Instead I wanted to be entirely led by listening very closely to what each line wanted, and was surprised how plainly each line stated its needs. As a result of following those shapes and rhythms, the setting I’ve ended up with is linear in structure. It’s definitely a “setting” of the poem, not a song with repeated melodies and a chorus. This makes me nervous, because it’s quite an experimental thing to do with a very popular poem. I like it, but will anybody else? I love poetry and I find it much easier to engage with aurally. I almost never read it on the page. Duffy is a fantastic reader and it’s well worth seeing her perform. As I was creating this setting of her poem I was reminded of something Martin Sorrell said at an evening about poetry translation at last year’s Exeter Poetry Festival – “The best way to understand a poem is to translate it”. That’s certainly the experience I’ve had so far, where setting is like translating. I kept remembering what I learned from that lecture: how there really are no direct translations of literature, it’s simply the role of the translator to get into the feel of the poem and use the words in that best represent it. The same thing applies with music. There is no exact sequence of notes that a poem can be translated into, but a composer can use the notes that best create the same feelings that the poem does.